Sometimes, people come together to do wonderful things. And sometimes, people come together to do terrible, silly things. When it comes to Steam's new tagging system—which is currently in beta—it's a mix of both. 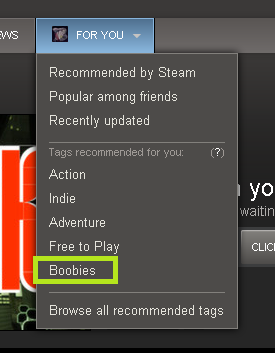 Yesterday, Valve introduced "Steam Tags," a system which lets users label games with a few words or phrases. Most of the tags are the sort of thing you'd expect: Skyrim, for example, is tagged as an "RPG," and clicking on the RPG tag lets you see other games tagged as RPG, too (clicking on a tag won't take you to a list of games if there aren't enough games tagged with a certain word or phrase, though). You can tag stuff nearly anything you want, though only the most popular ones will show up on a game's page. If a tag is used often enough, you can also browse other games with that same tag. Not all the tags are as straightforward. Notice something about the leading image in this post, for example? Casual is the last word most people would use to describe Dark Souls! And yet, there it is, currently highlighted as a popular casual game. Trolling is definitely a thing in Steam Tags right now. Let's take a closer look at some of the tags, shall we? Let's start with the "bad" tag. It does have games notorious for being poor—The Walking Dead: Survival Instinct, for example. It's hard to argue the quality of that game. Gone Home, though? It's not everyone's cup of tea, but that doesn't mean it's bad! Dang. Let's take a closer look at the "garbage" tag, shall we? Why is Fez on there? What are people saying about Fez, I wonder? Remember: this system is supposed to help people find games. Some of these tags aren't useful, or they unfairly paint a game in a negative light. BioShock Infinite and The Walking Dead also have spoilers attached to their tags...don't click on those links unless you want those spoiled, obviously! Other games might be spoiled too, so be careful when browsing tags on Steam. The Actual Steam Tags Tumblr finds that, if a game has a small enough community, they sometimes are able to get away with tagging something with all sorts of ridiculous and sometimes offensive things. Q. What if I don't agree with a tag that has become popular for my game? A. Tags can be a good indicator of when there is a mismatch between how you perceive your game, and how your game is perceived by customers. Often this is simply because there is some piece of information regarding the game that customers feel is missing from the store page. If this system is going to be a useful one, it's clear it needs some tweaks and possibly moderators. Right now, the system is a bit of a mess. It's not all bad, though! There are plenty of funny ones, too. Hopefully, if Valve changes the way things work, they find a solution that allows us to have some unorthodox but harmless/funny tags, too—not just serious and boring ones. What are you tagging your games on Steam? Find any noteworthy tags? Let us know in the comments.